Woman stares into a mirror to discover the face of her future husband (last century divination method). This can be one of the origins of the Blood Mary legend. Bloody Mary is a kind of ghost of a dead woman in Western folklore. 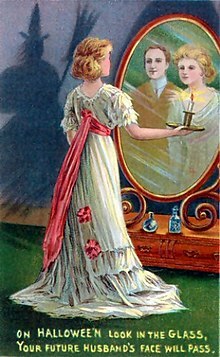 This ghost is said to appear in a mirror after calling its name three times or more, depending on the version of the story. Like the Ouija board, this game is played by adolescents in parties or small meetings just to have fun. The ghost's name can vary according to the tales said by the people. Some similar names are: Mary Worth, Mary Worthington and Hell Mary, among others.